This month is a chocolate torte with Valentine’s day in mind. The Aztec emperor Montezuma was said to consume the bean in copious amounts to fuel his romantic trysts and chocolate has since become associated with love. Dark chocolate is also high in flavonoids; which have antioxidant properties protecting our cells from damage. 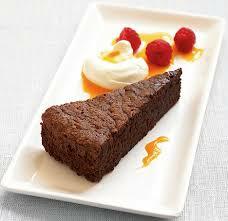 So enjoy some chocolate torte with the person you love on Valentine’s Day! 1. Preheat the oven to 150C gas mark 2. Line the base of a 23cm springform baking tin with baking parchment and butter the sides. 2. Melt the chocolate and butter in a large bowl over a saucepan of simmering water then leave to cool slightly. In a separate bowl use an electric mixer or hand whisk to whisk the egg whites to soft peaks. 3. Mix the sugar and almonds into the chocolate, then stir in the egg yolks and the amaretto. 4. Fold the egg whites into the chocolate mixture using a metal spoon, then pour int the tim and bake for 30 minutes or until cooked. 5. Whip the cream d add the 1 tbsp of amaretto. 6. Place the passion fruit flesh into a blender and blend to a pulp. Sieve and add icing suar to taste. 7. Place a slice of the torte on each plate, drizzle with the passion fruit coulis, add a spoonful f cream and decorate with raspberries.